While in Victorian times, yellow roses symbolized jealousy, today these sun-filled blooms represent friendship, joy and caring. 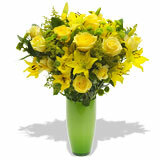 Throughout history, yellow roses have been closely associated with the sun. As the source of light and warmth, the sun is integral to life on Earth, and has been worshiped in many early societies. Yellow roses have many connotations. In many Eastern cultures, for example, the color yellow represents joy, wisdom and power. 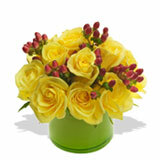 Yellow roses bring to mind all of the sunny, cheerful feelings of warmth and happiness. 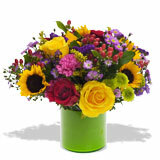 A bouquet of yellow roses will brighten someone's day. 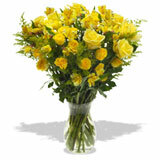 Arranging Yellow Roses: Yellow Roses said to symbolize “friendship”, are by far the most popular flower in the world. 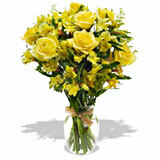 Yellow roses make a perfect gift for a loved one no matter what the occasion. When arranging Yellow roses make sure you remove the outer “guard petal”, on each Yellow rose, left on to protect your Yellow roses during shipping. This will ensure that your Yellow roses will bloom to their maximum. 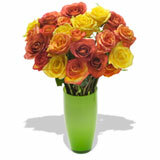 Arranging roses can be pleasure, and if done right will maximize the vase life of your Yellow roses. 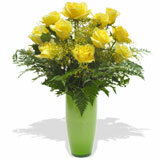 Yellow Rose Bouquet Care Tips: Your yellow rose bouquet has an average vase life of 5-8 days. If properly taken care of your yellow roses may last longer. 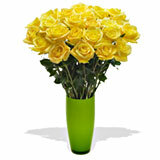 On receiving your yellow rose bouquet remove the foliage that falls below the water line and remove the outer guard petals, then cut the stems 1 inch diagonally under running water, Fill the vase with lukewarm water and add first packet of floral food, then place your yellow rose bouquet in the vase. Yellow Roses drink heavily, so make sure you check the water level daily and replace with fresh water, adding more flower food if necessary. 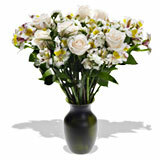 This will increase the vase life of your yellow rose bouquet by 30 to 50%.